Each mission you create should contain at least one win event and one lose event. Without both of these, you could be stuck forever in that same mission. However, you may wish to add more- you can have as many win and lose conditions setup as you like. As you can see with each new mission there is a default lose condition setup, which is that if your lord dies, you lose the game. We have an excellent guide on individual triggers and events in more detail, so this article will explain more on how to setup working events. Because in this version, they are two totally independent events, then you only need one event to trigger in order to win. So that means to win the game you can either clear all the gong, or eliminate all the rats. You should also note that events can only be triggered once. If for example, you had an event which would give you 50 honour when you recruited 20 Archers, this would only happen once. The next time you recruited 20 Archers, it would not happen again unless you had an entirely new event setup for recruiting 40 Archers. This is because if you had two events setup for recruiting 20 Archers, they would both trigger at the same time. Similarly, the terminology of the trigger Always does not mean the event will always happen, it is the chance of the event happening. So if you set the event to always happen, regardless of whatever other events are triggered, that event will always happen in the game. You can see here that there are is a win condition and a lose condition, as well as two other events. There is a Witchcraft event which will always happen, and an event which will send a bear attack when no bears are left on the map. However, this mission will not work as intended. 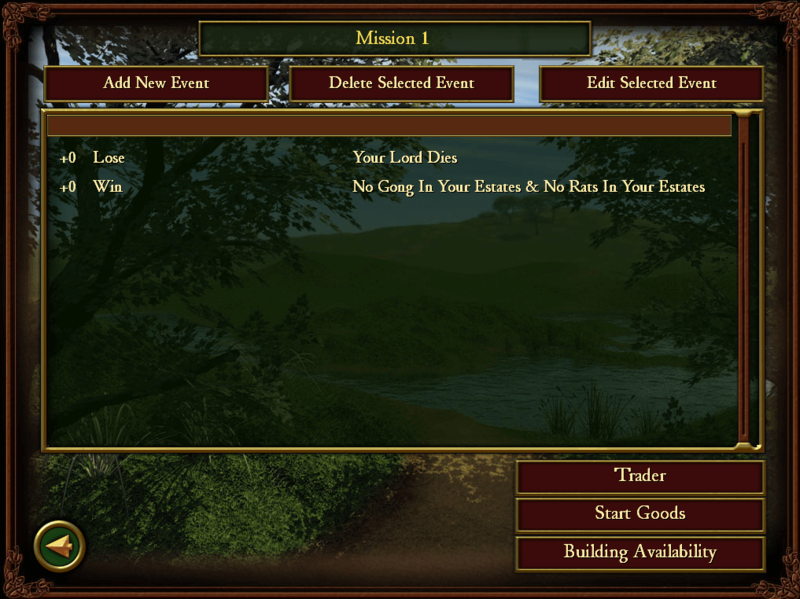 There are two factors which play into this: the first is because the editor runs relevant events top-down. That is, from the top of the events list to the bottom. Because of this, the Win condition runs before the event to add more bears on the map. The second reason, is because the events are also ordered ascending in terms of the delay before the event happens (the number on the left hand side of it). As you can see in my example above, there is a +1 delay to adding bears on the map. You can see all of the quests setup here. Quest A is to rebuild the ruined bridge. Quest B is to produce a large number of resources, and Quest C is to attain a specific population. 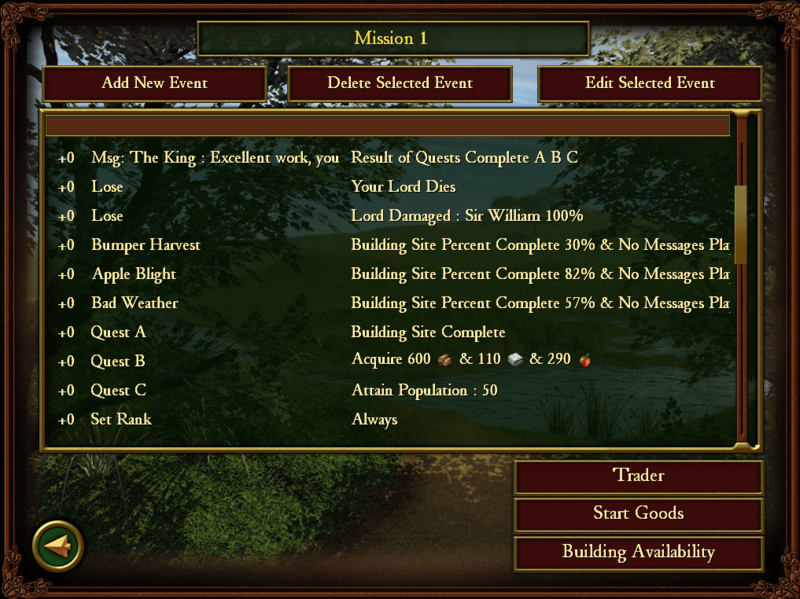 Once all three quests are complete, a message is displayed from The King. What you can also do with quests is dynamically setup events to change their status. For example, if you completed a quest, you can setup an event to change its status again back to Not Completed. You could also have events to trigger on the completion of single quests as well. Suppose I wanted to give some honour when the ruined bridge was rebuilt. I'd be able to use the Single Quest Complete trigger to check if Quest A is complete. When the ruined bridge is completed, that would complete Quest A. Because Quest A has been completed, that would then trigger whatever event has been setup as a result of completing Quest A (in that case giving some honour to the user). This makes it possible to set off chain reaction events. I set this event up using a Month delay. A month delay will prevent the event from being active in the game until that time has expired. So if for example, you kill off all the bears in January, and have a delay of this kind for 2 months on adding more bears, the event doesn't become active until the end of February. That means that even though you've killed off all the bears in January, because the event wasn't active it won't trigger until the following month when the game checks for untriggered events again. This is a very complicated concept to fully understand, but in more simpler terms it means the event exists, it's just disabled and can't be triggered until the delay is over. In contrast with a month delay, the other kind of delay does nothing to disable the event, and will just delay the event by a set number of months from whenever it was triggered. Back to my previous example, you kill all the Bears in January. The month changes to February, the game checks for untriggered events, and it finds this one. It delays the event by one month until March, then adds new bears in the map. 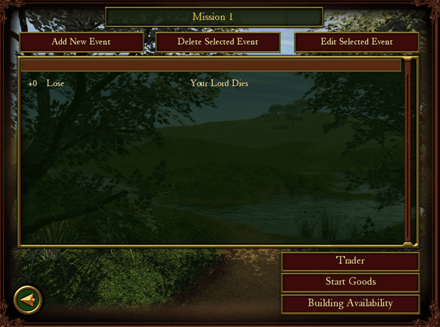 It's important to note that only month delays are shown on the scenario editor mission editor screen, that is, the delays until events become active.